There are 2 types of ants commonly found in Missouri, Carpenter Ants and Odorous House Ants. Richardson Pest Solutions is the best choice to eliminate the ants from your home. I keep seeing big, black ants in my house, especially in the kitchen and bathroom. I spray the ones I see, but they keep coming back. What kind of ants are these, where do they come from, and how do I get rid of them?" These are the questions typically asked by homeowners who have carpenter ants. They are also one of the most difficult to control. Carpenter Ants, vary in size and color but are usually large (1/4-1/2 inch) and blackish. Occasionally, swarms of winged carpenter ant reproductives will emerge inside a home. Carpenter ant swarms usually occur in the spring and are a sure sign that a colony is nesting somewhere inside the structure. Winged carpenter ants can be distinguished from termites by their larger size and shape of their antennae, waist, and wings. Carpenter ants damage wood by hollowing it out for nesting. They excavate galleries in wood which have a smooth, sandpapered appearance. Shredded fragments of wood, similar in appearance to coarse sawdust, are ejected from the galleries through preexisting cracks or slits made by the ants. The extent and potential damage to a home depend on how many nests are actually present within the structure, and how long the infestation has been active. Although large carpenter ant colonies are capable of causing structural damage, the damage is not normally as serious as that from termites. In some cases, the damage may be relatively insignificant, but this can only be determined by locating and exposing the nest area. The odorous house ant has become the most common and difficult ant species to control in Missouri, and throughout much of the United States. They form distinct trails along outdoor and indoor surfaces. ants emit what's been described as a rotten coconut or pine scent when crushed with a finger and sniffed. Ants foraging indoors feed on all manner of foods, ranging from the trash can to the cereal bowl. 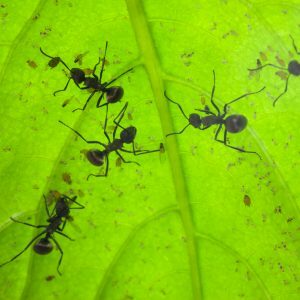 When odorous house ants are the problem, homeowners may be better off calling a professional, although they, too, are challenged by this ant. Some products used by professionals (e.g., Termidor®/Phantom® sprays, certain baits) can be effective but are not available to the general public. Oftentimes, it will be difficult or impossible to locate and destroy the carpenter ant nest(s). In this case, the homeowner may wish to call a professional pest control operator. Pest control companies approach carpenter ant problems differently. Some attempt to locate the nest and selectively treat only in specific areas. Other companies take more of a "shot-gun" approach, drilling and dusting as many potential wall voids and nesting sites as possible. Most companies also apply a perimeter spray treatment around the outside foundation of the home in an effort to temporarily prevent reinvasion. The approach which should not be used is simply to spray each month where carpenter ants are seen. If no effort is made to locate the nest(s) or probable nest areas, the problem will most likely continue.